Or our version of the Magical Mystery Tour. Or at least the Michigan portion of it. We all headed out about 9:30 with our first stop the only non-magical part. Nick want to get a photo of the grave of Sojourner Truth, a former slave and African-American abolitionist and women’s rights activist. Located in Battle Creek, MI, her grave lies near the graves of such cereal luminaries as members of the Post and Kellogg families. 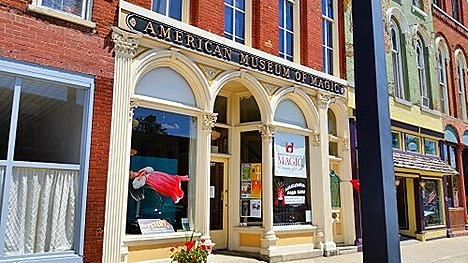 Our next stop was in Marshal, MI at the American Museum of Magic. The collection of magic artifacts was assembled by, and the museum started by Robert Lund, who, in his day job, was an well-known automobile writer, including Auto Editor for Popular Mechanics magazine. 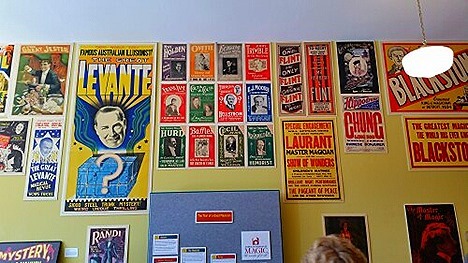 Although not a magician himself, Lund was fascinated by magic and magicians since he was a young boy and collected everything he could, including the thousands of posters and playbills that lined the walls. I’ll let Nick give you more info, but I was impressed by two artifacts in the museum. 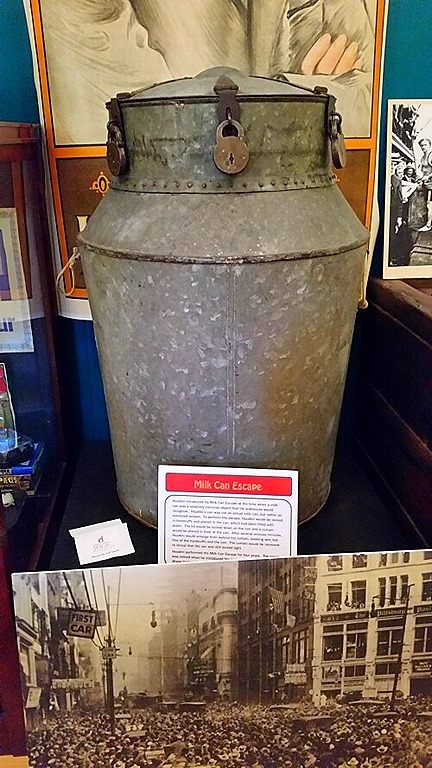 The first is one of the three remaining Milk Cans used by Harry Houdini as part of his famous escape routines. 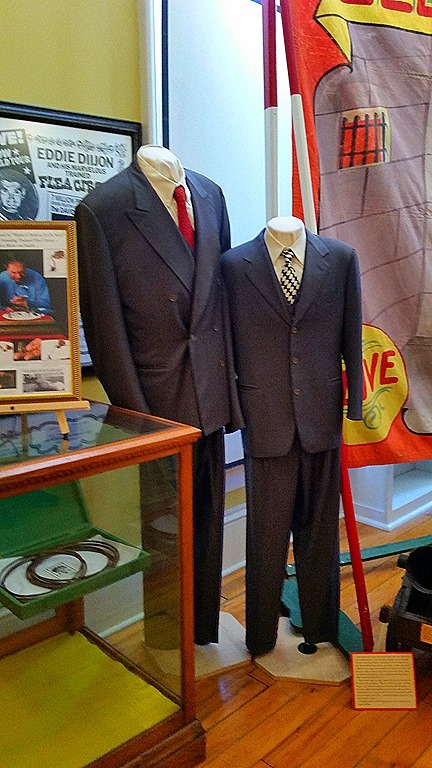 And on a more modern note, they have two suits worn by Penn and Teller, the well-known present day magicians. After a quick lunch at McDonald’s, we headed over to Colon, MI, home of two magic trick manufacturers, and a yearly Magic Get-Together where over 1000 magic enthusiasts show up. Colon became a hotbed of magic due to the fact the famous magician Harry Blackstone, Sr. bought a farm here in the 1920’s, and many fellow magicians flocked to the area. In fact, Blackstone, Sr, and his son-magician Harry Blackstone, Jr., are both buried in the local cemetery, as well as many other well-known magicians. After visiting the cemetery, we headed back to Elkhart after a really fun day. You might even say a ‘magical’ day. Sorry, I couldn’t resist. Later, after we’d been home for a while, we all headed out to have dinner at Culver’s. Really love their burgers. 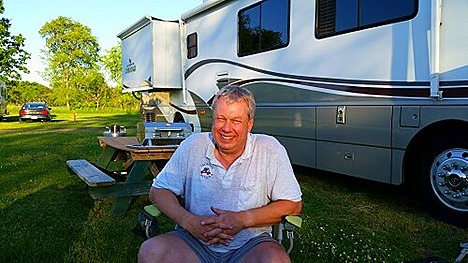 Back home, about 8pm, blog reader Bob Plaskon stops by to see Nick, who invited me over to meet him in person. We all sat outside talking until finally the dark, and the mosquitos finally drove us inside. "I liked ’em when I was 18. Why should I stop liking ’em now?" – George Burns, on why he kept the company of women 70 years younger than himself.